Have you been working on sprucing up a room? I have. Our little nursery is always a work in progress. I have added things here and there and it’s becoming more and more cozy. And here’s the latest addition. A Light Switch Cover. This will only take minutes to do and really adds a great little detail to the room. Buy a new cover or remove the one that’s on your light switch right now. Cut out a coordinating piece of material that’s just big enough to be able to wrap the extra fabric around the back. Slit a hole where the light switch would go and make additional slits, angling out towards each corner of the opening. Apply a coat of Mod Podge to the front of the cover. Lay the fabric over the top, making sure to center the hole over the light switch opening. Pull the fabric tight and fold the edges around to the back. Apply another layer of Mod Podge and let dry completely. Then add ribbon/buttons/embellishments to the front with hot glue. Re-attach to the wall and……wow! Very cute. I did the same thing with some comic book pages (my son's room is Batman) and it was super easy and turned out really fun. How cute and so perfect for kids, I love it! I'll be linking. You are SO SO crafty! I will use this idea for my son's new "TRACTOR" room. I made one for our nursery too a few weeks ago! It was so easy and looks so cute!!! It's addicting too, I'd like to make more for the rest of the rooms in the house too! That is sooooo cool. I forget about using Mod Podge! So cute. Except I think it will make my little ones play with their light switches even more! This seems so basic, like we should all have thought of doing that. Seriously, I would never have thought of mod-podging the light cover. Good work! I love this! What a fun and easy way to dress up a room, especially if you're renting and can't paint! Ashley!! I'm so glad I found your blog. I followed the link from Caryn Jone's blog and am so happy I did! How have you been? (If my name is throwing you off, this is Kristi Lewis-from high school) I've been linking to your blog from mine as I've been trying out the tutorials. If you wanna see my attempts at them you can go to canofsnails.blogspot.com I've been having so much fun trying them out! Hey! Congrats on winning the blog contest for that Utah baby magazine! That's awesome! You totally deserve it! Love it! One question… Which type of Mod Podge do you use? I went to Joann and there were about 5 different varieties…Matte, Gloss, Paper, etc. I was lost :) Thanks for all your great tips and projects! I now have even MORE on my to-do list! Can't wait to try out one of your other projects! I love doing crafts and belive it or not I have never worked with Mod Podge! SO my question to you is do I add the extra layer of Mod Podge to the fabric or the back of the plate? I am antsy to try it out. BTW love love love you stuff. 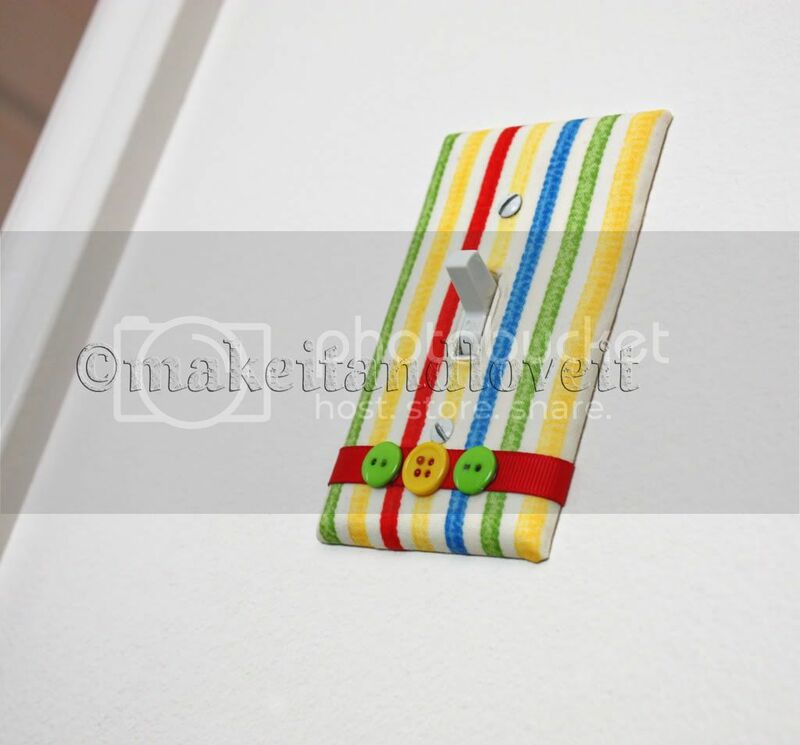 tifonly – I added a layer of mod podge to the front of the light switch plate, then attached the fabric, then another layer on top of the fabric. That really stiffens it up and keeps it in place. Good luck and have fun! Very creative. They look great!!! That turned out so adorable! I love the color it adds and the buttons are so darn cute! I made one recently using photo transfer with Mod Podge but think this would be so much fun for kids' rooms! i'm making these for my SIL's birthday. i almost gave up, but remembered that we have super glue. that helped to keep the little pieces of fabric where the switch goes down.i also used a sealer. I just made this today! It turned out so cute and is a great addition to my daughters room! I just tried this idea of a Mod Podged light switch myself. But the added ribbon and buttons on yours is exceptional. I actually want to make more and try that. It's so beautiful and looks so professional. Hi, Ashley! I love this idea–I bookmarked it even before I was pregnant! Now that I’m almost due I’m trying to match the “Ribbon Lamp” tutorial with this light switch, but my ribbons won’t glue onto the plate. I tried Modge Podge-ing the ribbons to a piece of fabric, but that’s not working either. Should I just resort to Krazy glue or is there another way I can do this? Maybe a different adhesive? Thank you so much! I love your blog! I don’t know, looks hard. I’ve been hooked on looking through your website all night. You are one talented lady. You are inspirational. You are generous in your sharing your talent. You certainly have the flare. I’m super impressed. The website is so professional looking, like magazine photos, one of the best I’ve seen. I have printed some graphics onto 24# paper and tried to make the covers, but the colors started to blend together and the corners tore when I folded them to the back. Am I using the wrong weight paper or won’t it work with graphics printed from the computer? Thanks for any suggestions because I’m really looking forward to making the covers!